Successfully Added GeekPS - 5 Inch Touchscreen GPS Navigator (Bluetooth MP3 MP4) to your Shopping Cart. The GeekPS - 5 Inch Touchscreen GPS Navigation Unit will allow you to boldly go where no one has gone before! It's a space-age GPS device, with features to the max, and tons of extras...the future is here and its name is The GeekPS Navigator! 2GB TF microSD card included free of charge! GPS device - The secret to The GeekPS's power is that it utilizes the Windows CE 5.0 operating system. With this in the background, you can load in today's hottest GPS software and maps. Buy or download the maps, but in the end you'll never get lost again with GPS functionality in the form of voice guidance, intelligent route planning, points of interest, and much more. Features to the max - The GeekPS Navigator features Bluetooth with FM transmitter. For those who don't know Geekspeak: pair your cellphone with the device. Then output calls to your car's speaker system. Handsfree and trouble-free! But that's not all. With The GeekPS you also get an amazing multimedia player. Yes, this baby plays XVID videos, but it also runs AVI, MP4, MPG, MP3, WMA, BMP, and JPG files too! Unbelievable? Believe it! Extra, Extra - Games and even an eBook reader! Stunning 5 inch touchscreen with stylus and such an affordable price. Once upon a time, only a few people had access to GPS. Now with these prices you, your family as well your online customers will have access to GPS navigation at its finest. Prepare to find yourself, or at least never get lost again. This GPS device makes a great addition to internet storefronts and webshops. Feature it on your new product page to generate some new sales and nice profits. Available in our warehouse right now, so place your order today and we will ship it out tomorrow. You don't have to pay to use GPS. The satellites which transmit GPS coordinates are maintained by the US government. You just need a GPS receiver to take advantage of the data. 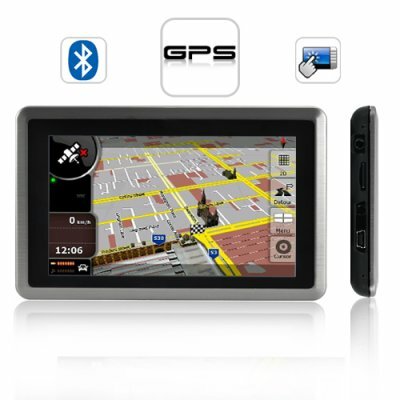 The GeekPS - 5 Inch Touchscreen GPS Navigator (Bluetooth MP3 MP4) contains a top of the line GPS receiver. Bought it for my father. Excellent product althought i wish greek language was preinstalled.